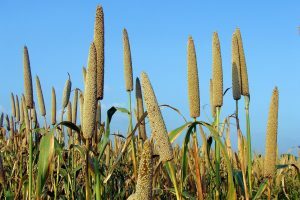 MILLET contains goitrogens which are substances in food that suppress thyroid activity and can lead to goiter – enlargement of the thyroid gland found in the throat. Low iodine intake can also lead to goiter. Hypothyroidism is at epidemic proportions in Western society, due perhaps to the constant stresses and strains on this gland to do with the pollution of our food, water, air and environment, and modern 24/7 isn’t helping either. Heating cruciferous vegetables – such as broccoli, cauliflower, kale, Brussels sprouts and cabbage, denatures much or all of this potential goitrogenic effect, whereas in millet cooking actually increases the goitrogenic effect, which may suppress thyroid function even in people with adequate iodine intake.